The number of electric vehicles able to power buildings and feed the power grid will grow from 100,000 today, to more than 5 million in 2017, according to a new study by Pike Research, a market research firm for the clean technology industry. The prospect of a power grid made more stable and efficient by millions of EVs connected to homes, and thus the power grid has been a much vaunted secondary benefit of widespread adoption of electric cars. So far it’s not even close to happening. But, the researchers predict, it will by the middle of the next decade after continued exponential EV adoption, especially in commercial fleets. As of now there has been exactly one commercial test project of V2G possibilities. That was headed by the University of Delaware and PJM Interconnection, and it concluded in 2010 (PDF report). The data from that project will shape future plans for commercialization, Pike research predicts. There are a few obstacles and disincentives for utilities to connect cars to the power grid, according to the report. 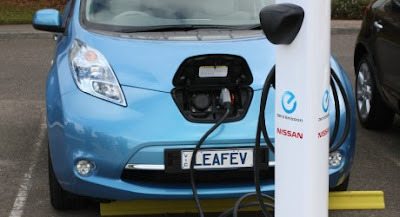 One hitch to growth right now is that one Nissan Leaf on a block is not enough to interest a power company in building out vehicle-to-grid connections in an area. There needs to be a cluster of EVs close enough to each other to tempt a utility. Fleet vehicles, like these electric delivery trucks, are the best candidates for a cluster of battery power storage the researchers posit. While EVs could take on excess power from utilities, something they certainly want, utilities could potentially lose money on power served to homes with vehicle to grid capacity. If car batteries are able to take and store the cheaper power offered in off hours, the car itself could be a cheaper power source for a home or business during the expensive peak daytime hours. Just how an electric car, a home, and the power grid will all interact is still far from sorted out. ”Vehicles will compete with traditional generation sources as well as with emerging technologies, such as stationary battery storage,” according to the report. What might turn out a more popular relationship between the next generation of car and power grid is for the car to help the grid more than the power the home it is connected to. Utilities and automakers are both keen on using EVs for frequency regulation, accepting more power for a faster charge when more power is available, and taking less when demand is straining the overall grid. ECOtality, an EV charger company, announced today a plan to use cars on their charging systems to help Maryland utility, Silver Spring Power Co. regulate their supply and demand through a smart-grid EV connection that shifts EV charging to off-peak hours if needed. Finally, the report authors note that carmakers don’t benefit from selling an electric car that can give back to the grid as compared to a car that can just charge up as normal. So until consumers clamor for that extra service, the feature is likely to be limited to costly retrofits or special orders, rather than standard with all new EVs, further limiting adoption.